Developed equity markets pushed lower as trade tensions continued to weigh on sentiment. The S&P 500 Index suffered its first weekly loss in November, down 1.5%, as nine of the eleven underlying sectors turned in negative results. Heavily weighted technology shares continued to perform poorly. Broad market weakness to begin the week was exacerbated by news that the White House was considering new tariffs on auto imports, a move carrying significant implications for the domestic auto sector given the importance of international supply chains. Stocks gave up early gains Tuesday after crude prices suffered their worst intraday decline since 2011 following President Trump’s criticism of Saudi production cutbacks. In the end, small cap stocks outperformed large cap while value bested growth across the market capitalization spectrum. Real estate, materials and utilities stocks held up best, while consumer discretionary, technology and energy stocks lagged. 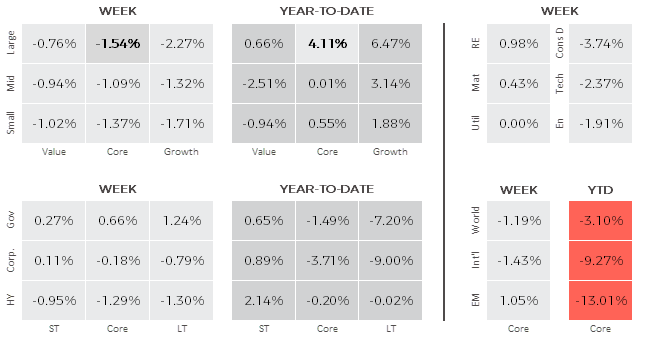 Developed non-U.S. markets, as measured by the MSCI EAFE Index, decreased 1.4% as Brexit fears and Italy’s budget standoff with the European Union (EU) continued to unsettle markets. Banks were among the top decliners on worries that the UK would leave the EU without a deal. Brexit fears increased throughout the week, as British Prime Minister Theresa May lost parliamentary support for her draft agreement on Britain’s withdrawal from the EU and was forced to reshuffle her cabinet after key members resigned. Emerging markets, as measured by the MSCI Emerging Markets Index, turned in the best relative results with a 1.0% increase. Chinese stocks rose for the week, as trade-related concerns took a backseat and bargain-hunters gobbled up shares that had fallen to depressed levels. The yield on the benchmark 10-year Treasury fell sharply from 3.18% at the end of trading the previous week to 3.08% at the close Friday. The decrease in yields pushed bond prices higher, especially for longer-term Treasuries that are particularly sensitive to interest rate changes. Credit markets struggled amid general equity market turbulence and elevated concerns stemming from energy price disruptions. In a holiday-shortened week, durable goods orders, consumer sentiment, and existing home sales will be reported along with PMI data in the U.S., Europe and Japan.